Greetings in the name of God. I bring you God’s blessings. My dear friends, since some of you are pondering the subject of world weariness—an indefinable longing or melancholy or sadness which may at times take hold of you—I would like to choose this subject as the theme of today’s lectures. The feeling grows from several roots, therefore there are a variety of possible causes for world weariness. Of course the yearning for God and perfection plays a role here too whether consciously or not, as well as the nostalgia for one’s true spiritual home that dwells in every human being. For here on earth you are only visitors, it is not your true home. But that is never the main reason for the indefinable longing. Its background is more complex, and this is what I want to talk about now. When people deviate in their souls from the divine laws in any respect—and the more unconsciously this happens the greater the deviation is—then a vague feeling of sadness and longing can grip them at times; it is as if their higher selves would respond and encourage them to sense that something is not quite right within themselves. For instance, they do not know how to open themselves up to loving in the true sense of the word; they cannot move out a feeling which is vital in the life of a human being. As a consequence love does not come back to them in the right and fulfilling way. Then a feeling of weariness is the answer of their souls. Fear of disappointment is a sign of oversensitivity, and the oversensitivity is a sign of a false sense of self-importance. This entire inner process centers around the ego, and that must block the stream of genuine love, having a contrary direction. The blocking goes against divine law and therefore the soul must suffer. The moment you reset the “inner switch” so you do not take your fear of what could happen to your own self so seriously, you can give your love freely. Then your love is pristine and unadulterated, because the “thou,” with everything that you miss and long for, will become more important than the “I” with its vanity and pride. Then the feeling of unfulfillment, of vague yearning, will disappear, since you are fulfilling a vital function of human nature and are thus in harmony with God and your own higher self, at least in this respect. Do not misunderstand me. I do not want to imply that a person who has this particular misconception is necessarily selfish. He or she may even be less selfish than another who has already found the key to this problem. One should differentiate between selfishness and self-centeredness. Both are wrong, but their effect is not always the same. I do not even want to imply that such a person may be petty and unwilling to give. It is just that, in ignorance, genuine feelings are channeled through the sick lower self into a false direction. It is not even that individuals who fit this description cannot love at all. There may be a few people around them to whom they reveal all their love. Yet they will not be able to avoid the vague, weary feelings. This is so because if the energy of their feelings were channeled in the right way, even in respect to those few beloved people, their love would not be concentrated on just a small number of people, but would go out toward anybody in their environment who can elicit positive feelings. Then they would reach out with a fully committed love, not afraid of taking risks, even to the extent of lovingly giving just as much importance to the other person’s feelings as to their own. All this cannot be taken for granted, my friends, for no matter how much you may agree intellectually and in principle, the feelings lag behind, except in very rare cases. Naturally, your love would be different toward each individual, because you human beings take it as a matter of course that one indeed loves some fellow human beings more than others—and as long as your state of development still keeps you in the cycle of reincarnation one cannot expect you to believe otherwise. You know also from experience that your love for your mother is different from your love for your mate, that your love for your sister or brother is different from your love for your child, your love for your father different from your love for a friend, and it even differs from friend to friend. There are so many varieties of love currents, and they all have substance and form in the spirit. Their colors, shades, sounds, and fragrances are of a wide variety. And the human capacity to love would be large enough to produce all the diverse energy currents if only the sick tendencies of the ego would not stand in the way. When you love someone very much, you often have the vague feeling that then you must be taking some love away from someone else whom you may want to love even more, and you have the same feeling about someone else’s love for you; it seems as if one person would have to be shortchanged in favor of another as love is being shared. Yet genuine, healthy love is indivisible; it never diminishes. The more love you generate, the more it multiplies itself. I do not want to be misunderstood here either: I am not referring to sexuality and eros. This is according to eternal law, and you have to find the truth within yourself. So it is with God, Who loves His innumerable children, Who always loves more, never less. How can genuine, healthy love be attained? Not by trying to force yourself to love; this does not work. It can be reached only indirectly, by starting with yourself, that is, by thorough self-examination, without self-deceit. Find the extent of your ego, your oversensitivity, your vanity, your pride, and how they play their part. Whoever has understood this has made the first step toward attaining true, genuine love, and thus also toward lifting the feelings of longing, sadness, nostalgia, or whatever else you want to call them. Only you can look into your soul, and if you find that not everything is all right within you, then you know also that your soul needs to be healed in this respect. When people concentrate all their love on one person, and they do this in the wrong way because their soul is not healthy in this area, then the love for this one person will weaken them. They may be so afraid to lose the love of the other that they cannot be true to their own self, and thus they will indeed humiliate themselves and be humiliated by the other. It will happen in an unhealthy way, out of weakness and fear, not out of strength. Actually some people believe that self-debasement is the sign of real, great love; however, they are deceiving themselves. Others are so afraid of exactly that—being humiliated—that they cut themselves completely off from too strong feelings. When you love in a healthy and genuine way, you never compromise your dignity. You may well have to give up insisting that you must preserve your dignity at all cost, but exactly because you give up the insistence on your dignity can you win what you were ready to give up. This is the immutable spiritual law. You will differentiate clearly in your soul that you have to give up your pride, the importance of your ego, but you do not have to give up being true to yourself. This may be difficult to understand at first, but meditate on it and you will perceive the difference. Those who can love in a genuine way without being afraid that their little pride might be hurt or that they may encounter some disadvantages, will never be “mistreated,” provided they guard against betraying their own integrity out of fear of losing the love of their beloveds. They may be disappointed, but they will not be unduly humiliated. Real love will never make you lose your dignity; you will always be able to stand up for yourself. Healthy dignity will bring you respect and not humiliation or exploitation. 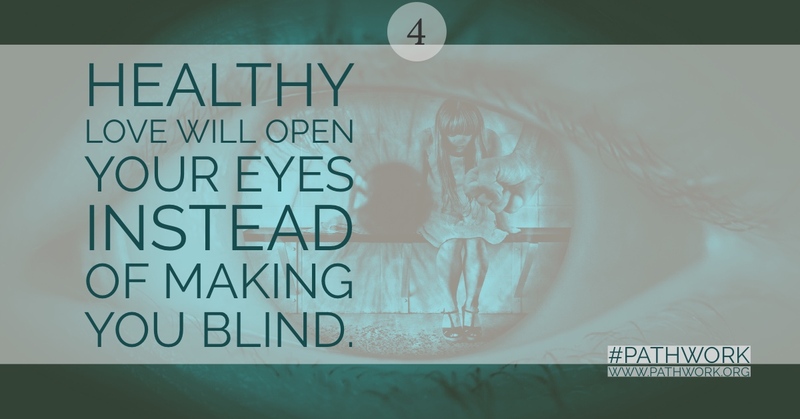 Healthy love will open your eyes instead of making you blind; it will make you strong instead of weak and always true to your self, exactly because through giving up the little ego you will no longer attach so much importance to the fulfillment of your own wishes. Genuine love is healthy, and as such free from masochistic or sadistic tendencies; it will not be egocentric or violate your personality. I want you to observe that there are always two opposing currents. Think about it, my dear ones. Fear—more or less hidden in the human soul—is a major obstacle to attaining real love; and fear can be present only when you love yourself too much in some respect, when you take yourself too seriously, when you are too concerned about your own well-being, when you hold on to yourself instead of letting yourself flow and surrender in a healthy way. Those who make themselves too important must be in fear; those who do not give themselves that much importance do not have to be afraid that something bad will happen to them if they let themselves love. Fear covers your eyes with a heavy veil, so that you become blind. You can neither see yourself nor others. Genuine love is not blind, for it can come only out of a fearless soul. It will have the strength to react more or less in the right way, while the wrong kind of love is weak and weakening, and will thus make you react in the wrong way. As I said, real love creates a natural dignity very different from false dignity, which is based on pride and vanity. Such wrong currents in the soul then produce warning signals in the form of feelings of world weariness. Another source of world weariness can be found in an attitude of withdrawal, in which a person retires into a lonely, self-created world. Again, they do this out of fear of giving up their little selves, or of taking risks, or out of a crass ego-centeredness. Such withdrawal into a self-created world may yield them certain momentary advantages in freeing them of responsibilities for others, affording them to lead a life exclusively and uncompromisingly according to their personal preferences. Yet they pay a higher price than they are initially aware of. They act contrary to spiritual law and so their higher self makes itself known by causing them to feel world weary. Thus they will, from time to time, experience great dissatisfaction with life and therefore feel alone, isolated and abandoned. All human beings strive, in their soul’s core, to give, to fulfill and even to sacrifice. Yet where the blind, sick, or immature parts of the soul resist this striving, two opposite currents come into existence which tend to cancel each other out. One part of the soul wants to give love—and therefore also to receive love. Whatever you give comes back to you as a wave in an eternally pulsating cycle. Of course, you have to start the cycle by giving first and not waiting for the other to start by giving to you. This part of the soul wants to fulfill itself, wants to surrender the ego, to sacrifice, and will endeavor with all its strength, with every single current of feeling, to abide by the spiritual laws. It wants to forget itself and not take its vanity, pride, and personal advantages so seriously. Such an emotional current comes from the higher self that knows where true fulfillment, happiness, harmony, and perfection are to be found. This current exists even in less developed souls, but in them it runs underground, so to speak, and only rises to the surface on rare occasions during a lifetime. The other part of the personality wants comfort, convenience, and will give up nothing. From time to time it sees the light of happiness, but prefers to exist in a grey, solitary world that seems risk-free to the blind part of the soul. This is an example of an inner decision which I have mentioned previously. Inner decisions can be made only when you have become aware of the hidden emotional currents and can pinpoint where they run into the wrong channels so as to cancel each other out. Cross-currents create not only psychological and spiritual obstacles, but also physical manifestations in the body: tiredness, weakness, and even sickness can come from emotional short-circuits. The more frequently the opposing currents clash within the soul, the more the person will lose the strength which would otherwise work productively in a healthy channel and thus renew itself all the time. People usually know much more in their intellect than in their feelings, but since the unhealthy feelings cannot adapt themselves to the healthy, conscious thinking while they are hidden in the unconscious, they need to be brought up into consciousness. Quite apart from the spiritual truths and the divine lawfulness to which all humans who wish to live a healthy and harmonious life are subject, any reasonable human being knows that one cannot move simultaneously in two opposite directions. Therefore it is absolutely necessary to make the inner contradictions conscious, even if resistance has to be overcome. You often call an emotionally ill person immature, at least in those areas where the soul is unhealthy. Indeed, immaturity is a childish quality, because it means to want the impossible, like a child. An immature person does not have enough reason to recognize that each action or non-action brings with it the corresponding consequences, which the mature person is able to distinguish and accept. He or she can thus freely give up the impossible, whereas emotionally sick and immature souls would insist on having the advantages of both the opposing alternatives and none of their drawbacks, having their cake and eating it too. When they have to face the fact that this is not possible, their inner rebellion increases and with it their conflicts. For rebellion against the unalterable is in itself a sick emotional current. The inner conflicts can increase to such an extent that they begin to be reflected and manifested in the person’s outer life. There are many kinds of cross-currents, not only those I mentioned. Short-circuits can, along with other symptoms, cause indefinite longing and sadness, and anyone who is haunted by similar feelings frequently should search in this direction. Of course, it is not so easy to uncover deep and often unconscious currents, and you will need all your willpower to conquer the resistance. The longing for God and for one’s true spiritual home does not completely explain the feelings of world weariness. The unsatisfied longing is indeed for God, but in a different sense than you commonly assume. Only when a human being lives in perfect harmony with God’s laws can the longing for God be stilled. When you come close to God in this way and remove all the obstacles that prevent you from living in harmony with God, you can satisfy your longing for God already in this life on earth. For those who fulfill completely, to the best of their capacities, in accordance with God’s plan, their earthly life, their individual task, which corresponds to their state of development, will be free of any kind of inner disharmony. There will be in them no torment, no bitterness, no tension, nor any sadness or world weariness. Going back once more to inner decisions, I would like to mention that when you make a negative decision in the full knowledge and acceptance of all its consequences and related renunciations of whatever has to be given up—not only rationally but eventually also by bringing your emotions in accord with it—you are better off than if you were to insist simultaneously on two impossibilities, desiring only the advantages and not accepting any of the drawbacks of the two alternatives. For instance, when you decide to withdraw and live a solitary life because you do not want to give love, out of anxiety and over-sensitivity, then you must also inwardly reckon with the fact that you will stay solitary and will lack love. Certain joys and satisfactions must then be given up, not reluctantly, but completely. Even a negative decision, if it is truly meant to be carried out, is one step closer to health than the inner indecision and the desire to have it both ways. For in this way you will at least unify yourself inwardly and will no longer be torn by inner contradictions. In order to reach a negative decision at all, you must take pains to honestly confront yourself, bring the unconscious into consciousness, and commit yourself to pay at least one price, even if for the wrong alternative. Such straightforwardness serves the soul’s health, even though it may not be the best possible choice. Thus when people choose to cut themselves off outwardly or inwardly from others—and often this happens only in the inner sense—they will understand right away what this choice implies. Selfishness, anxiety, oversensitivity and pride have won out. When as a consequence the longing for love, fulfillment, light, brotherhood and fusion with another being touches them, they will confront this longing and tell themselves: “I have so chosen, I know the price, and I prefer to pay this price rather than give up my negativity.” It will be precisely through the inner work that is necessary to make even a negative decision honestly. Thus they will enable themselves to come to the realization later that they would, after all, prefer to make the true choice and that it would be worthwhile to give up what at first seemed so difficult to renounce. Most damages are caused by not making any choice and allowing all emotional currents to mingle in the unconscious, without the effort to really getting to know oneself. Such state of indecision will wear out the soul, lead to unavoidable conflicts, so that no energy will be left to fulfill life as best as possible in other areas either—whether spiritual or material. Emotional cross-currents or short-circuits are not equally strongly present in all people; there are many gradations. Therefore it is not a matter of either/or. In some cases the opposing emotions surge with equal power and clash with such fury that the waves of feelings completely submerge the person, so that he or she can no longer cope with life. And from a certain point of view it is much better, because the person will thus find the way to a freely chosen healing much sooner. Without upheavals most people, except those few of a very high state of spiritual development, would not find the way to health. When the inner conflict is not quite so explicit and one current is more out in the open than the other, they will still feel counter-currents, at least from time to time, which will sap their strength and will prevent them from completely unifying the energies of their soul. There are also other causes for feelings of world weariness. All of them stem from some distortions in the soul, but I will not go into that now. I have given you enough, so that everyone who hears or reads my words has ample material for self-search. Whoever has such longings should know that his or her unconscious emotional currents are not completely healthy and free. You should attribute enough importance to your soul and to your entire personality to really uncover what is hidden within your self, alone if possible and if not, with help. Yet you cannot really uncover what is in you if you still insist on attributing so much importance to your pain, to your vanity, and to your fears. Only by minimizing the importance of these can you find the courage to discover what is hidden, to let go of pretenses, and to change your inner reality. I want now to touch on something else, because it is related to today’s theme. This is self-pity, which often strengthens the feelings of world weariness. Wallowing in woes feels so good to you, and you convince yourself that the pain you experience must be borne because it is your destiny. Yet in truth this is very often not the case; as I have explained, such woes stem from distorted soul currents, which you have the power to correct. The sickly enjoyment of suffering—you call it masochism—is caused by specific tendencies. On the one hand you run away from real problems you do not want to confront; on the other you find in such pleasant pain a compensation for the privations of your life experience. These may have karmic reasons, yet quite often courage and willpower could relieve them if only you opened the inner door. Regardless of the burden of your past lives, regardless of what you need to experience now on the outer level, you can, by meeting the inner conditions which I am showing to you again and again, heal your soul and bring your feelings—not only your thoughts and actions—into harmony with spiritual law. As a result your life will be emotionally rich, harmonious and happy, completely fulfilling you wherever you are in your development. Last but not least, consider this also: By rebelling against something you cannot change, you throw your life into disharmony. On the contrary, it will never harm a soul to accept an unalterable stroke of fate. Naturally, one will not, need not, and certainly should not be glad to accept such a burden; that would be impossible. Yet one can resign oneself to it without rebellion and bitterness. The sadness that comes from undergoing such hardship will in some way help to free the soul. I believe that you have all felt this at one time or another. Whenever you wallow in self-pity, you are unconsciously remembering an earlier reaction, when your pain was commensurate with the gravity of the situation. By wallowing in self-pity you try to reproduce this remembered feeling, but in circumstances which are no longer the same; when the hardship was unavoidable, your surrender was the right response, but now it is different. Now you can change your attitude toward your pain. Because of this difference, the same feeling can in one case be right and healthy and in another case be sick. Perhaps you will be able to understand this. My words tonight are not easy to grasp and I ask you to think about them carefully. Be blessed, my dear ones.